Customize the Delta Trooper blaster for battle-ready action! 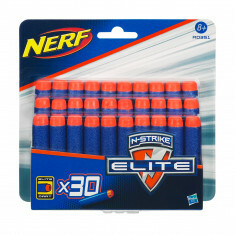 This Nerf N-Strike Elite blaster comes with a separate stock and barrel extension for different configurations. After battlers size up the battlefield and their opponents, they can configure the Delta Trooper blaster to optimize their battle strategy. Use the blaster on its own to take on the competition. Attach the stock to help stabilize shots. Add the barrel extension for distance targeting. The blaster is designed with built-in attachment points for the customizing gear.